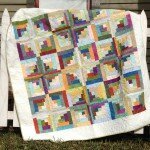 We will have several patterns available for purchase $3.50 for ideas on how to set up your curvey log cabin quilt. Class is this Saturday at noon after our club meeting. You will need the creative grids curvey log cabin ruler (we will have them available for purchase if you need one).